President Trump officially withdrew the United States from the Paris Climate Accord, the landmark environmental agreement signed by 195 nations in 2015, that is aimed at combatting global warming. The goal is to bind countries together in their coordinated efforts to battle the earth's rising temperatures from carbon emissions, and requires participating nations to put forward their best efforts on climate change as determined by each country. Only two other countries, Nicaragua and Syria, have not signed onto the accord. The decision by the United States, the world's largest producer of carbon emmissions and, until now, a global leader in the fight for climate change, could have a devastating domino effect on participating countries and their joint efforts to manage the slow scorching of the planet - which reached it's hottest year on record in 2016. 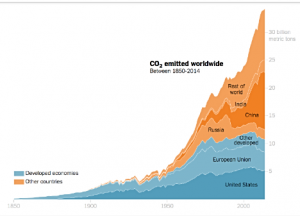 Under the accord the United States had pledged to cut its greenhouse gas emissions 26-28% below 2005 levels by 2025, and commit up to $3 billion in aid for poorer countries by 2020. Trump, who previously proclaimed climate change "a hoax," cited the withdrawal as a part of his duty to protect US citizens from a deal that imposed unfair environmental standards on American businesses and workers, and "punishes the US (but) poses no punishment for the world's great polluters". The move was immediately condemned by heads of state, political leaders, scientists, corporate CEOs and environmentists worldwide. In a rare joint statement, the leaders of Continental Europe's three biggest economies, France, Germany and Italy, said "We note the United States' decision with regret," and rebuked Trump's invitation to reconsider the terms of the pact, saying they were "not negotiable." An Aprl, 2016 Pew Research Poll showed that Majorities in all 40 nations polled say climate change is a serious problem, and a global median of 54% believe it is a very serious problem. Former President Barack Obama, who has avoided public comment through most of Trump's tenure, proclaimed "The nations that remain in the Paris agreement will be the nations that reap the benefits in jobs and industries created." Under the pact's rules, the process for backing out of the Paris accord is a lengthy one that will take an estimated four years -- completing it just in time for the next US presidential election.